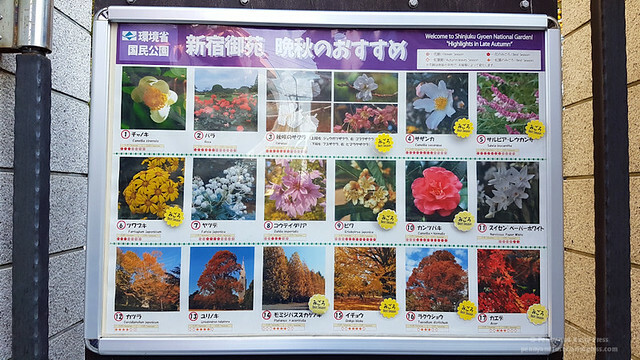 Day 9 in Japan and we were all set to do a bit of Autumn Foliage sightseeing. 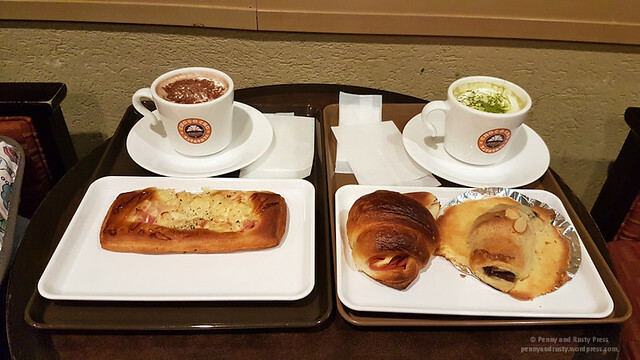 But first, we needed some nourishment so we picked up some flaky pastries at our local St. Marc Cafe. 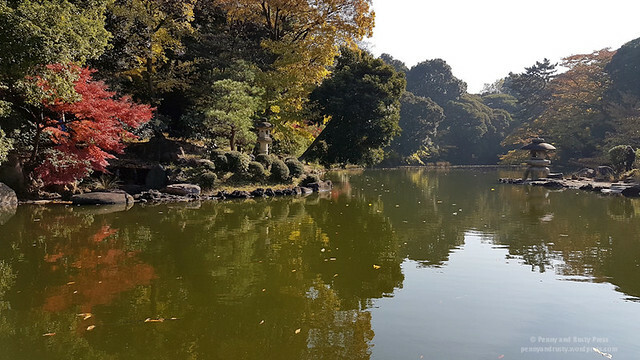 Our destination for today was Shinjuku Gyoen Garden, former residence of the Lord Naitō of Tsuruga in the Edo period. 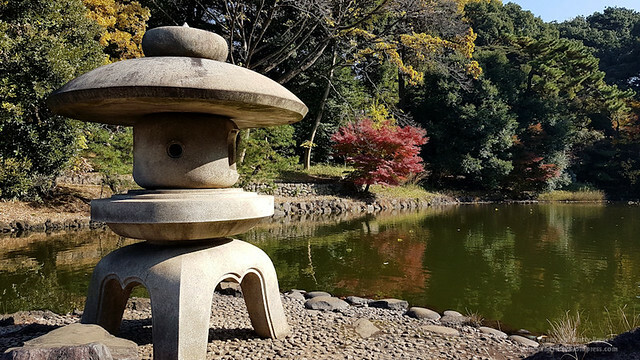 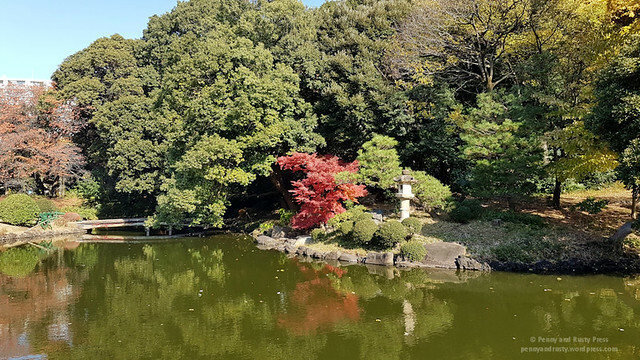 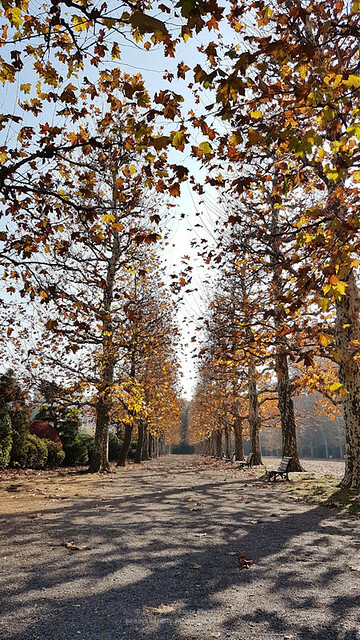 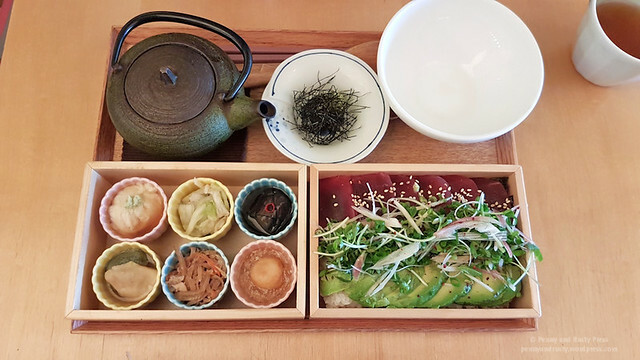 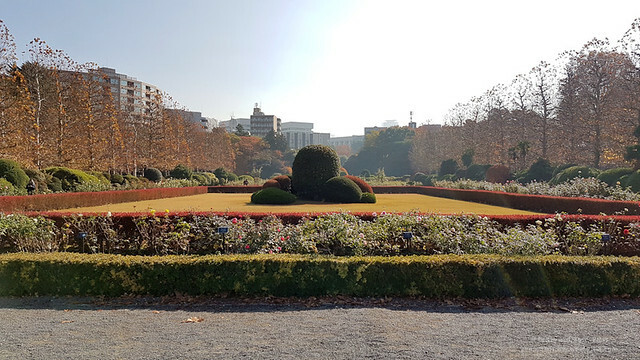 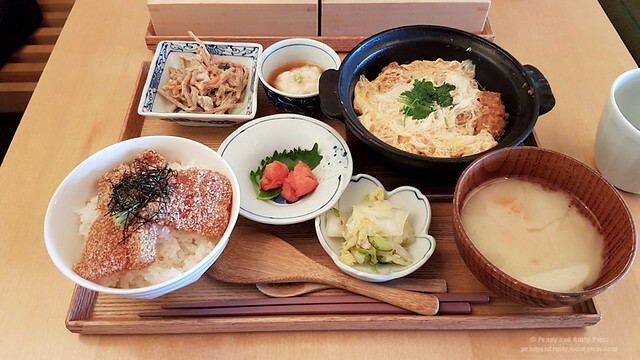 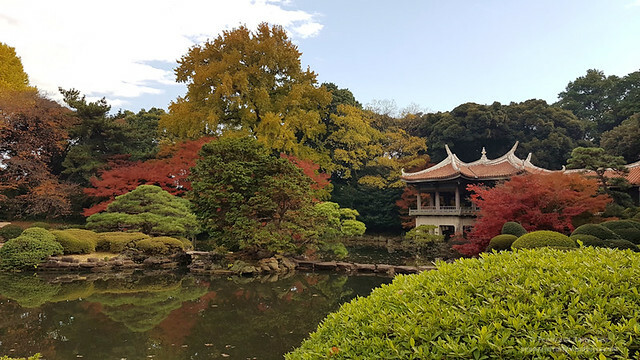 A garden has existed here in some form or another since 1772… first as a garden for the daimyō and then as an experimental agricultural centre after the Meiji restoration. 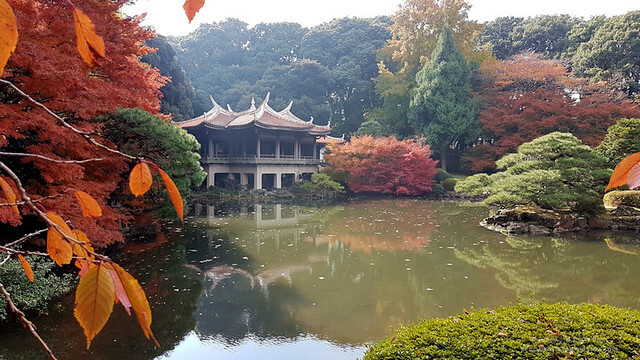 It was later converted to a botanical garden before it became an imperial garden in 1879. 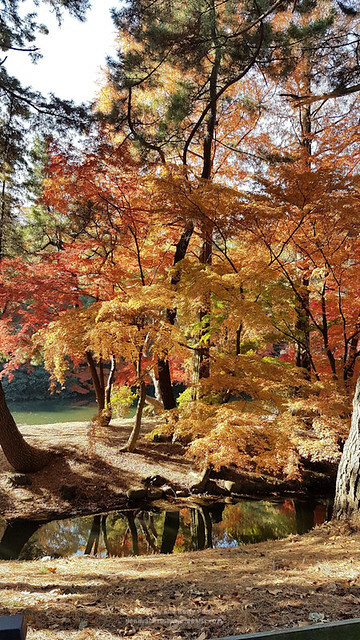 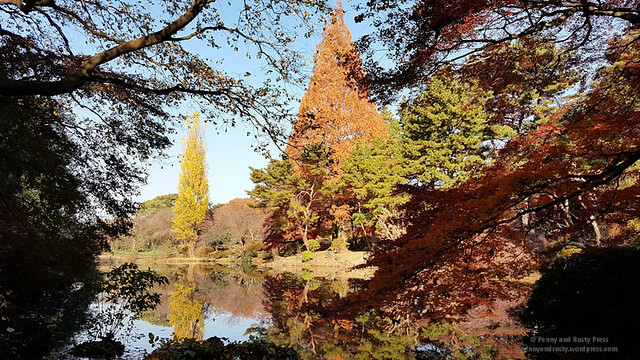 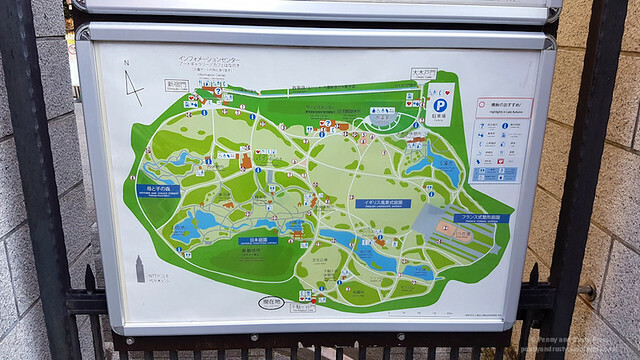 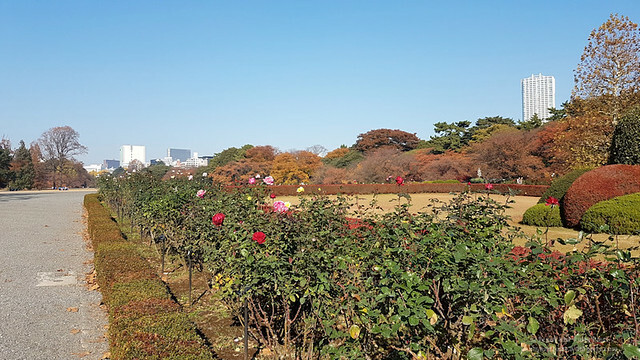 Admission to the garden is 200円 and grants you access to almost 60 hectares of land. 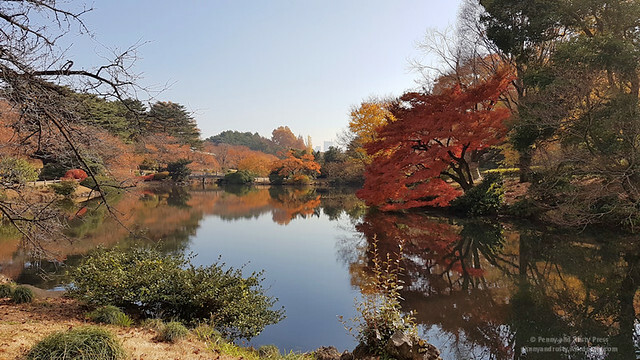 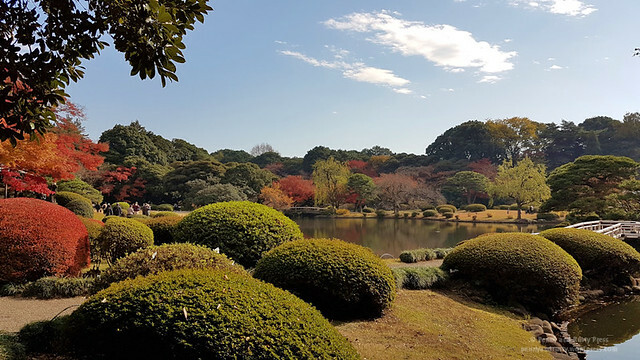 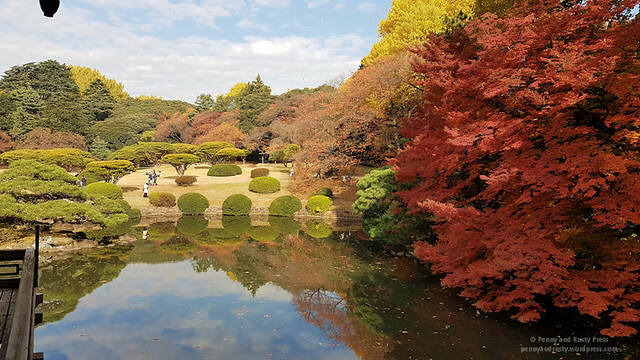 The garden is split into 3 different styles: a traditional Japanese landscape garden featuring a large pond with walking bridges and well manicured shrubs, a symmetrically designed French Formal garden, and an expansive English landscape garden to the north. 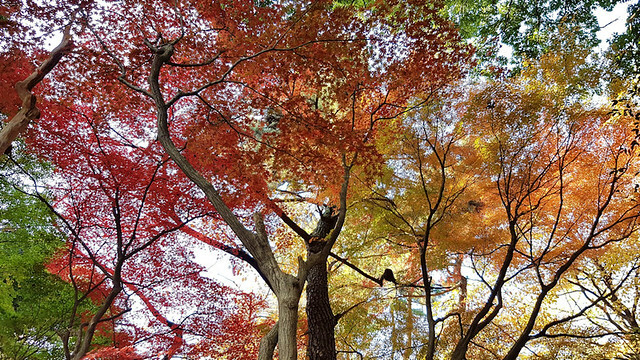 There are lots of colourful trees in this garden including Maple Mountain on the eastern side of the park. 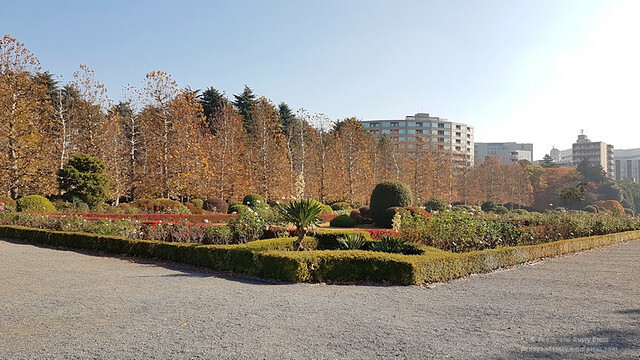 Next to the rose garden is a row of tall sycamore trees with bright yellow leaves. 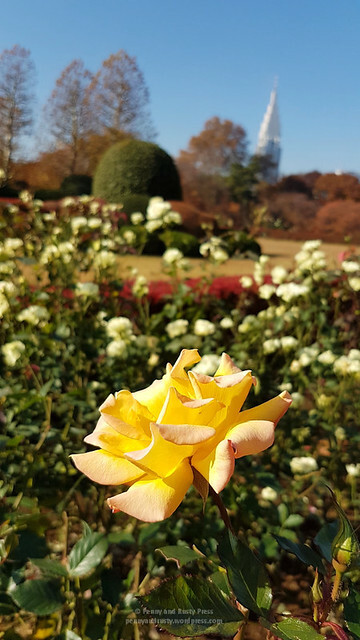 The day turned out to be a beautifully clear and sunny day which allowed us to enjoy the rose garden. 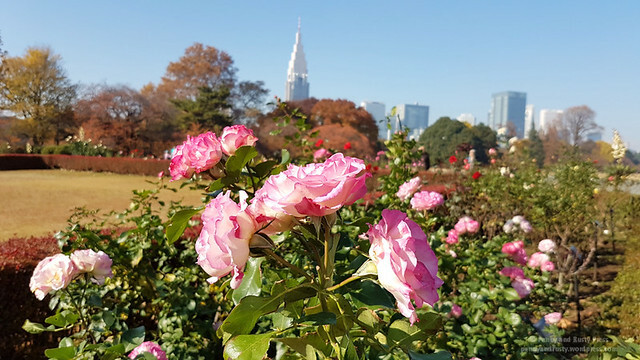 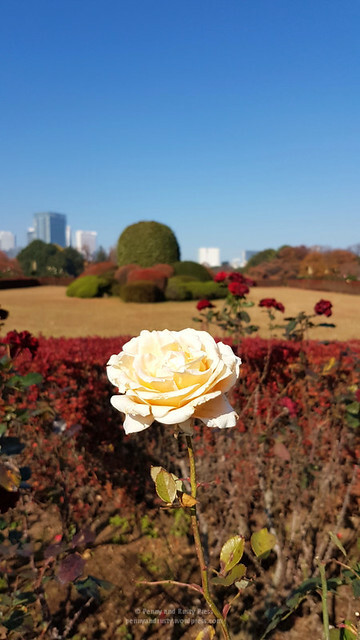 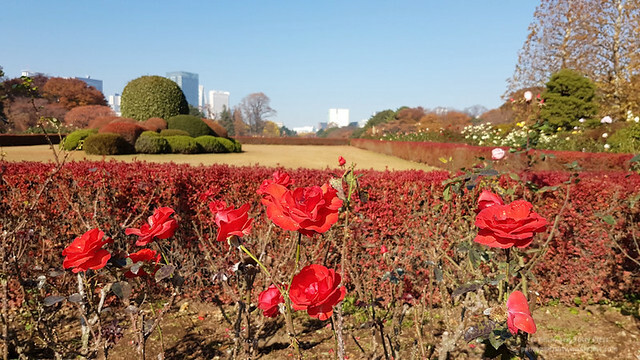 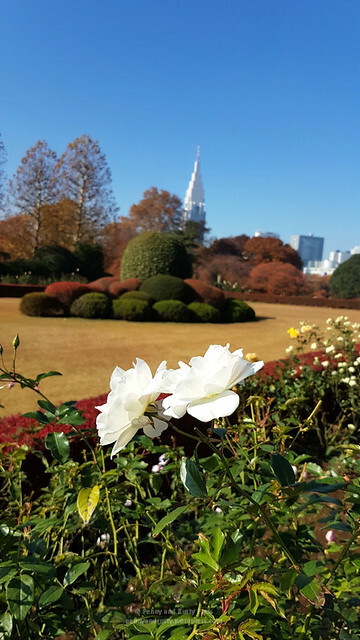 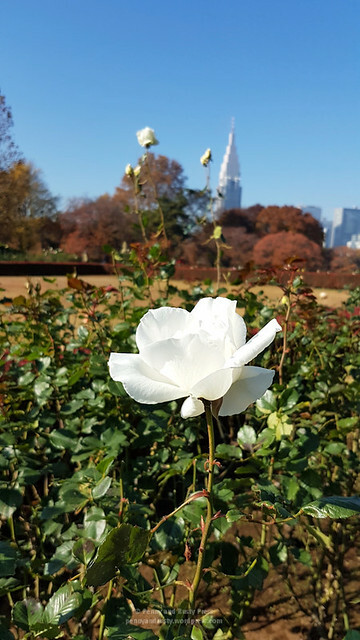 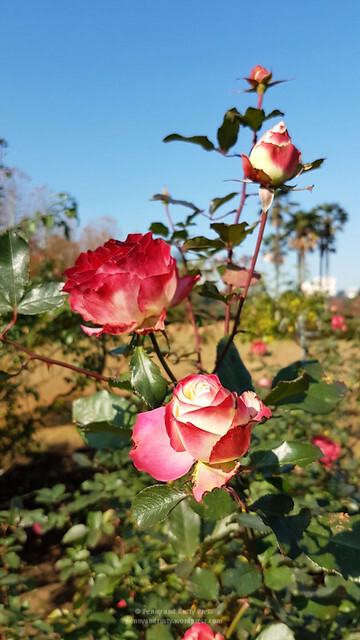 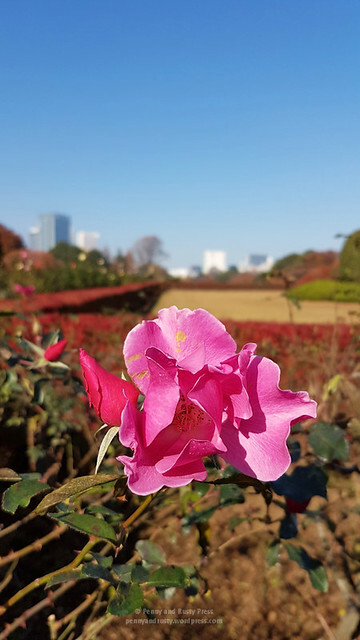 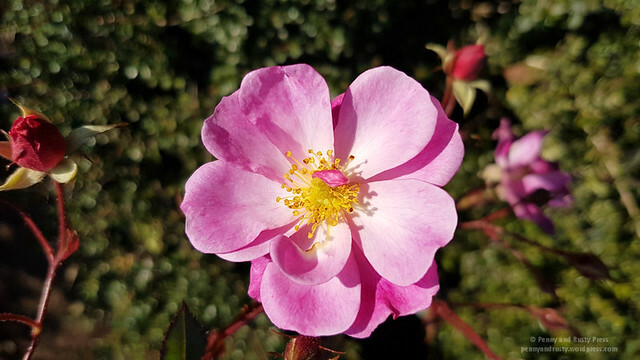 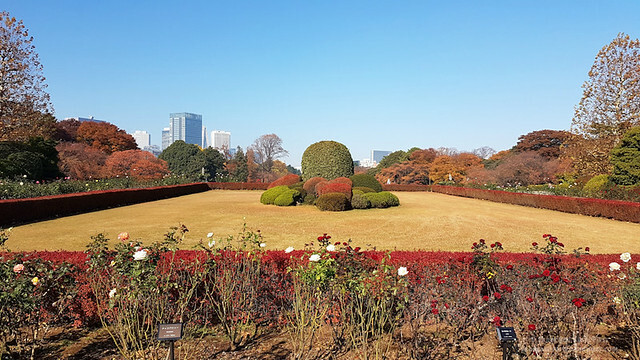 As I mentioned on our visit to Osaka, I was surprised that the roses were still in bloom in late November. 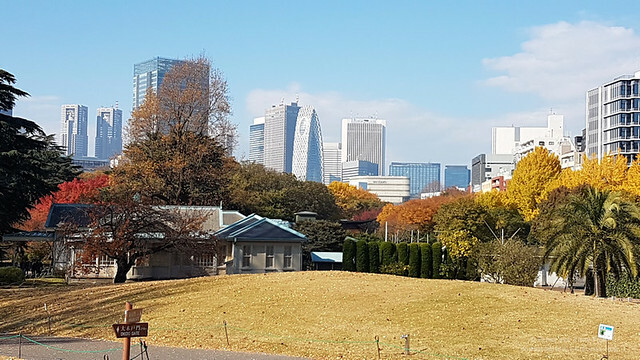 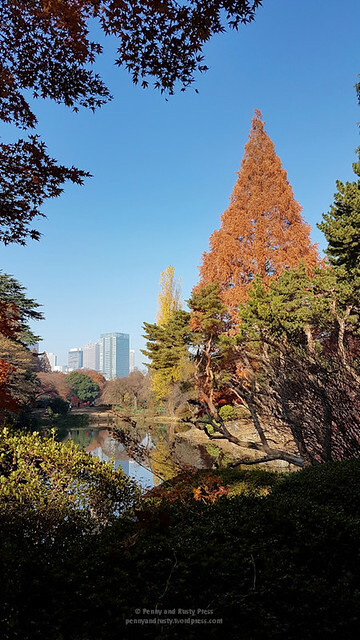 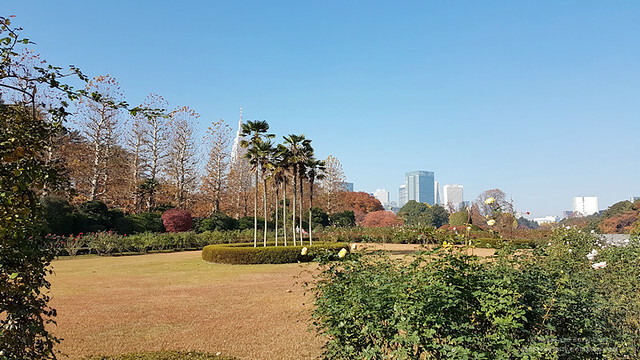 Of the many tall buildings that serve as the backdrop to the gardens, NTT Docomo Yoyogi Building is probably the most noticeable. 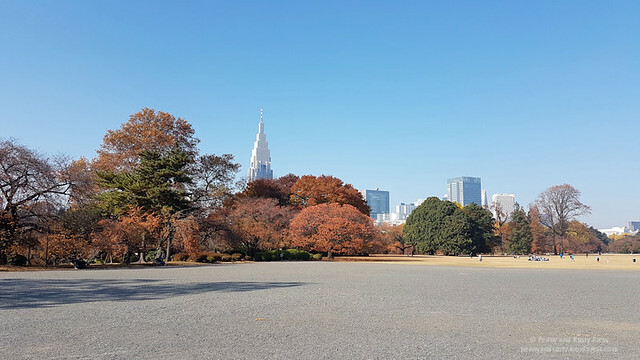 At 240 metres, NTT is the fourth tallest building in Tokyo. 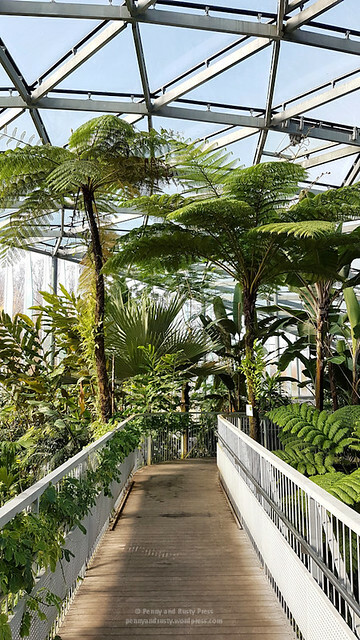 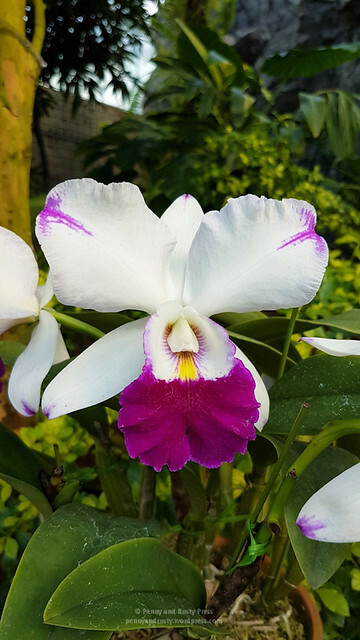 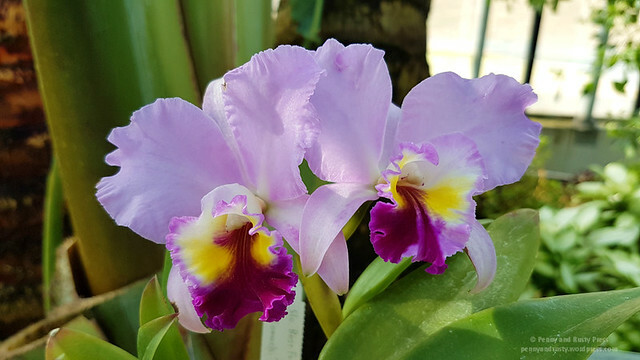 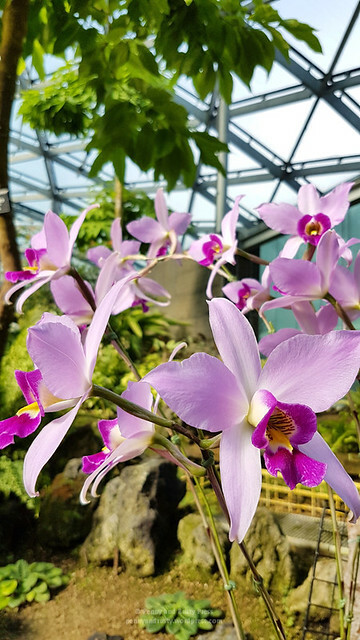 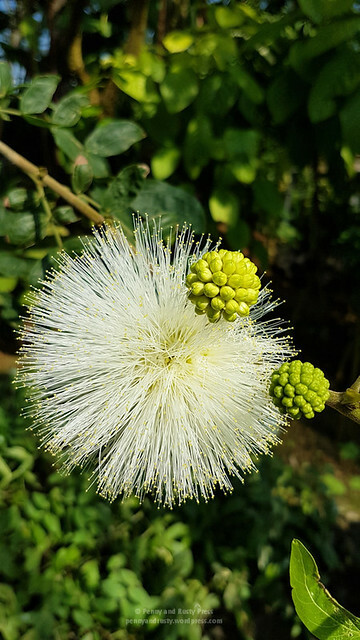 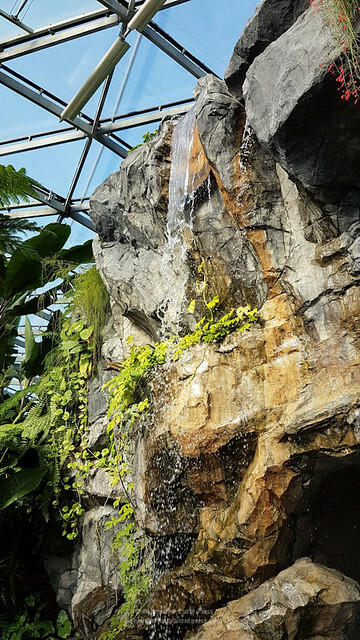 In the north part of the garden is a large greenhouse which showcases a large number of tropical and subtropical plants. 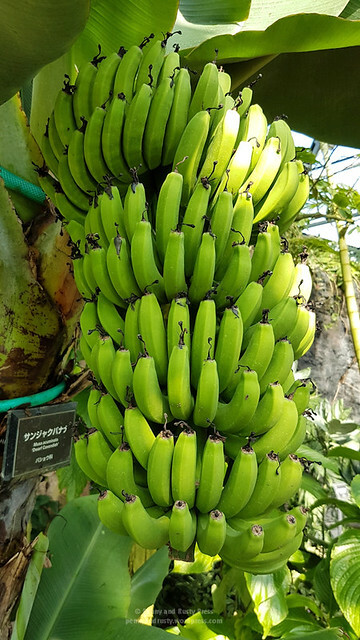 Fair warning… it’s super warm in the greenhouse. 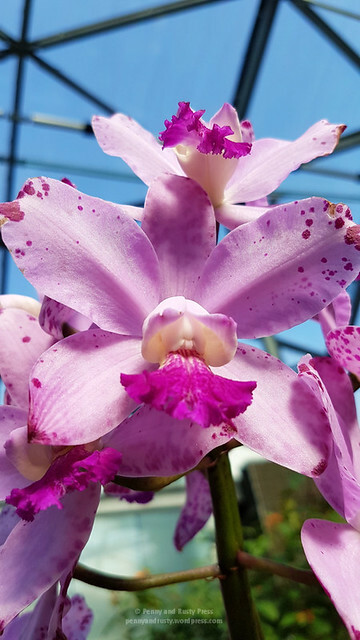 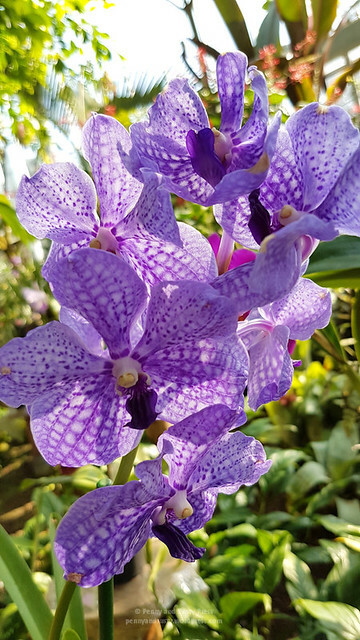 We lost count of all of the different orchid varieties that we saw here. 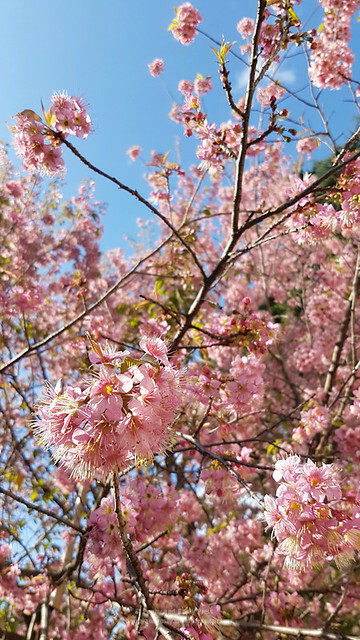 An unusual find is the cherry blossoms which we found blooming in late November. 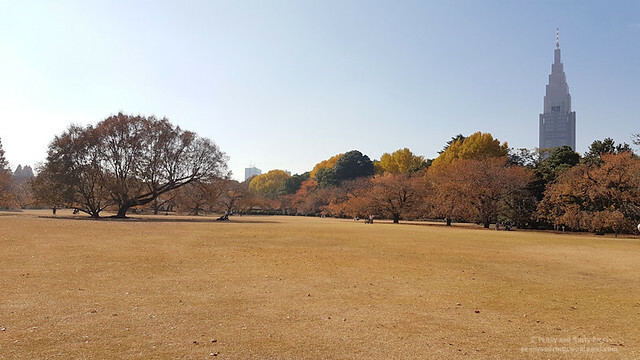 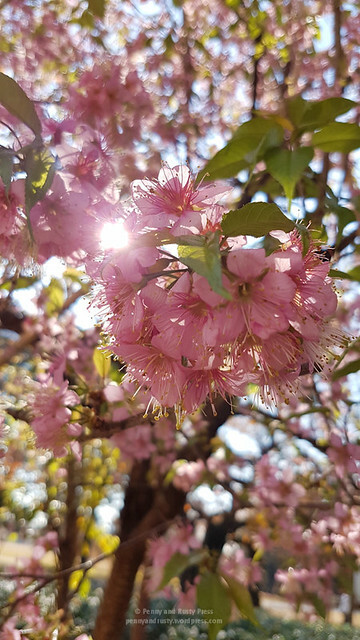 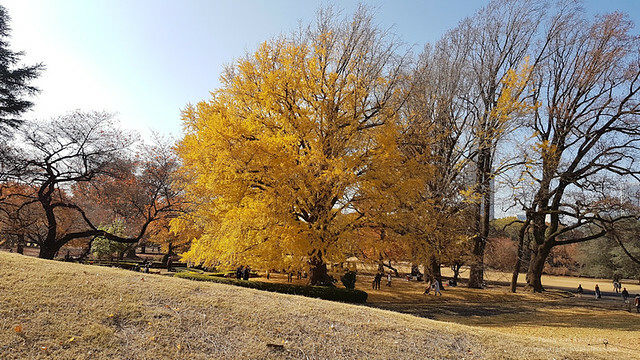 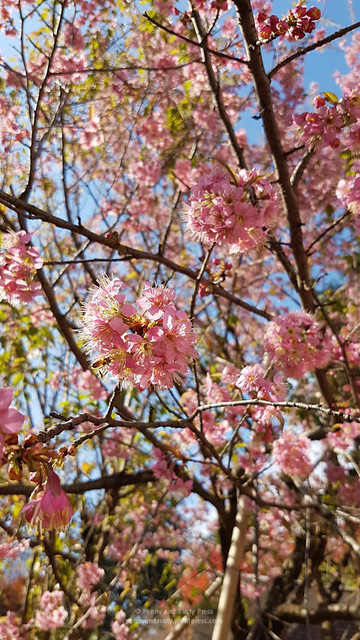 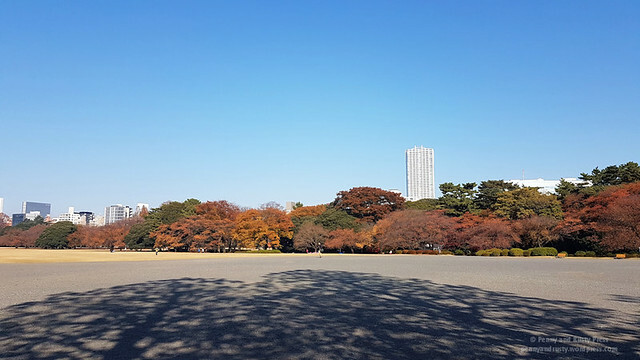 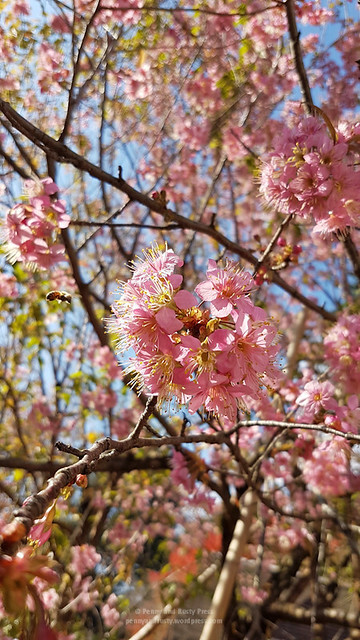 Usually, cherry blossoms are seen in the spring (and Gyoen Garden is supposed to be one of the nicest places to see them in the spring). 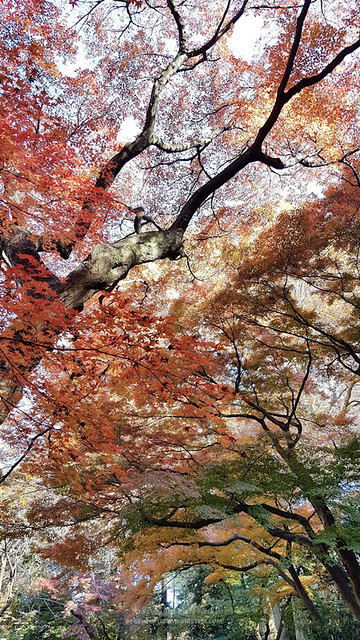 However, we randomly came across this beautiful tree tucked away in the corner. 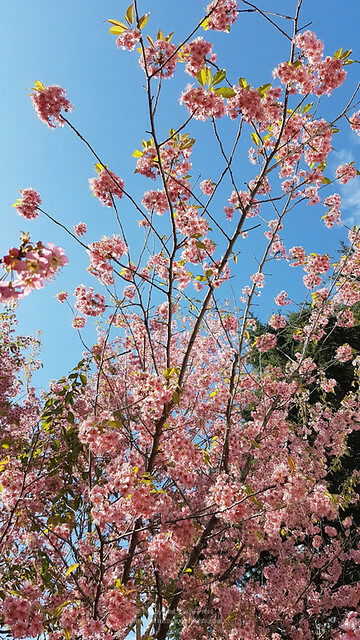 With the clear blue sky in the background, you’d almost think we were here during the spring. 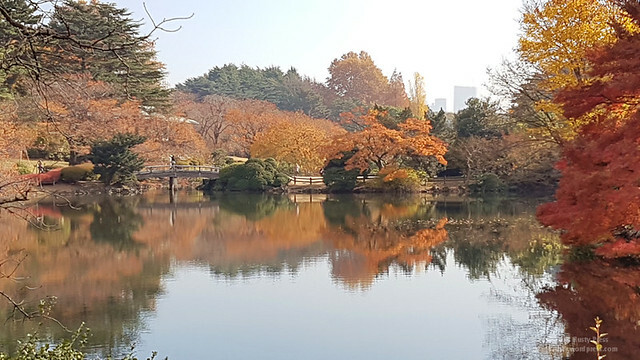 The reflection of the colourful trees in the pond are quite striking. 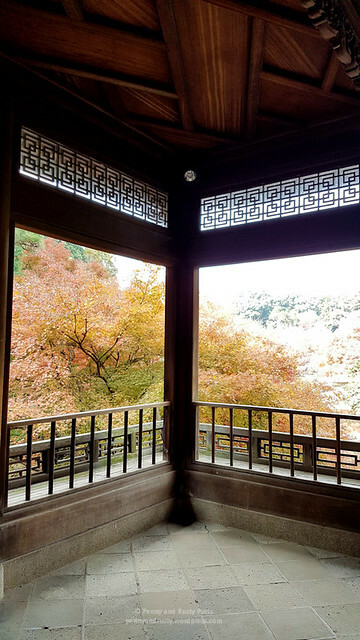 They also have some tea houses that you can visit and take pictures from. 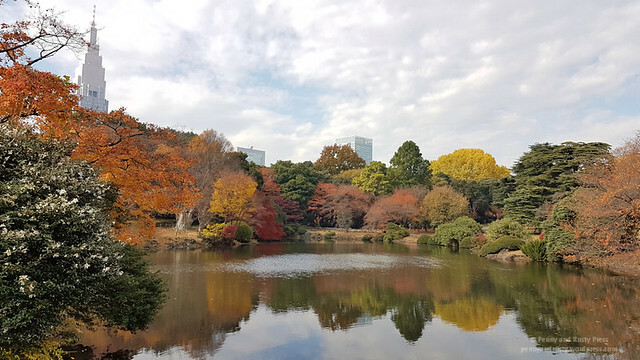 We spent over 2.5 hours wandering the gardens and probably could have spent a lot more time here but we were getting hungry from all of the walking so we headed over to the nearby Shinjuku Marui Annex and found a restaurant on the 8th floor called Ishibekouji Mamecha that served up some traditional Japanese lunch sets. 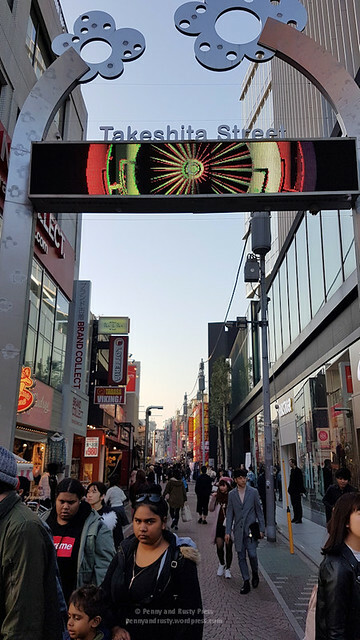 After lunch, we walked from Harajuku, past Takeshita Street, and over to Toy Sapiens. 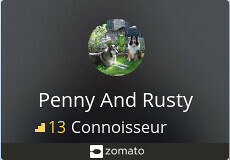 If you’re looking for pop vinyls, this is the place to go. 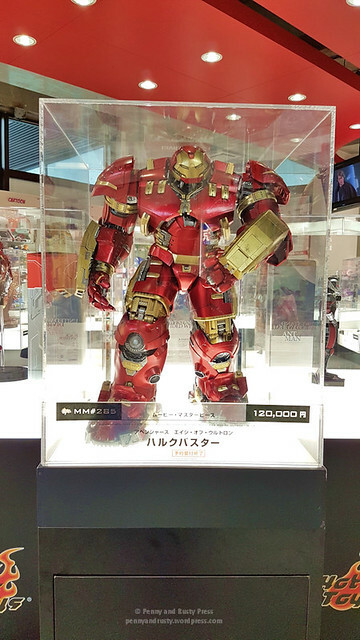 They also have some impressive models like this Hulk Buster Iron Man for 120,000円. 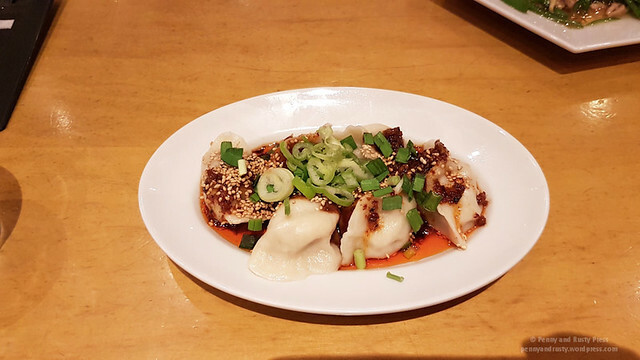 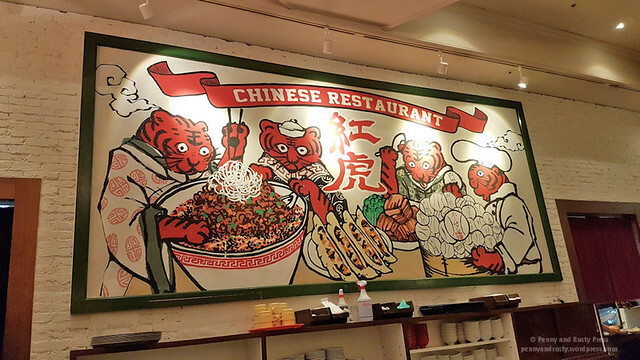 We closed out our night with some delicious Chinese eats at Benitora Gyozabou located at LaQua.